Teachers biographies and class descriptions of the contactfestival 2019! The classes are not divided into levels. In case the teacher found it necessary to ask for certain abilities you will find it inside their class description. Please read the descriptions and respect your own limits. In the registration process you will choose your intensive. Just make your decision depending on the themes of the intensives. The classes you can choose spontaneously at the Festival. On the first day the focus will be on Contact Improvisation principles. is a choreographer and dancer living in Granada. 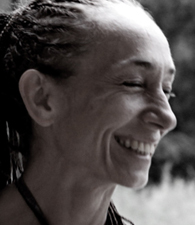 In 1992 she graduated in Dance Performance from SNDO (NL) and returned to Madrid where she co-directed Estudio 3 for 8 years, teaching CI, diverse dance workshops, dance&music impro research groups and co-created the collective UVI-La inesperada with Mónica Valenciano, Olga Mesa, Elena Córdoba, Blanca Calvo & La Ribot. 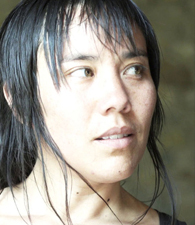 Throughout the years she has taught in various universities and independent spaces in Spain, Holland, Russia and Brazil and has created her own pieces and dance interventions, as well as collaborated with different dance and theatre makers. 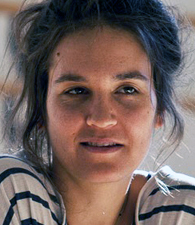 She worked with La Porta dansa independent (2005-2012 BCN). She has published the book “Arquitecturas de la Mirada” (2009 BCN) and curated Intermitencias del asombro (Madrid 2014). From 2012-2017 she collaborated with Elena Córdoba & Jaime Conde-Salazar in the project "Bailar, es eso lo que queréis" and was member of MisiónDivina an itinerant artistic collective for research around body practices. For the last two years she has accompanied Brut Nature, a gathering among resident artists of la Caldera (BCN). At present, her interest focus on the displacements that body and action can put at play to affect perception in order to mobilize our choreographic and political imaginaries towards other conceptions and relations with the world; displacements in search for approaches that avoid ideas of fixity and normativity. How to allow body and movement to access spaces that expand our choreographic and circulating imaginaries? How to approach movement as is happening as an action and gesture committed to the moment, to the space and the others? How to generate an alive space for dialogue where the established hierarchies and the preconceived or cultural classifications can be destabilized, constructing other possible narratives not subjected to the politics of sense/signification, allowing the body to trace other geographies and ways of choreographing our relationship with the world, the gaze and the affects? Throughout this workshop we’ll throw ourselves into a „state of dance“ in which the contours, edges and borders are blurred, letting a certain porosity of forms and a shared breath of the gazes and bodies. While fluctuating between having and being a body we’ll dive into those intersectional spaces between gaze & action, movement & stillness, attention & dispersion, the codified & the unknown. Bringing action and space in contact in order to create frictions, crashes, fusions or states of fluidity; allowing our selves to be touched or pierced through air, sound, touch or contact. The body as place and place as time in which to happen, to occur... a search of a perceptive state that allows a multiplicity of states of being yet to be known. I am a dance artist/teacher and Instant – Composer. I don‘t identify as a contactor and especially as a CI teacher. Yet most of what I practice and share has essential relevance to the form. My dance practice is an unlearning process. Dancing is my way to observe the memory layers I am made of. Some of these memories are keeping me alive, others are in the way. They act as protective shield that separates me from things, people, reality. Dancing is the listening practice that gently dissolves this shield, layer after layer. The older I get the more porous I am, the more alive I feel. I am currently conducting a research on Poetic dance documentation: What if dance artists apply their skills to document their own practice? What kind of documentation could emerge from such an approach? Since I have encountered the work of Lisa Nelson in 1999, my dance practice shifted from exercising the body to exercising the attention. Now, I experience the body as a vehicle for the attention and its dance, as a poetic experience that emerges from a deep listening activity. During this intensive we will practice sensorial explorations mainly addressing touch and vision. We will duet with different kinds of environment (the room, another person, objects or outdoor) in order to observe the movement of attention and it is intimate connection with the emergence of a poetic space. We will also find inspiration in an article by Claire Petitmengin, a disciple of F. Varela. According to her, we use our attention in three different ways. When we hear a sound for example the attention focuses first on “the source of the sound” in order to identify it: this is the sound of the wind. Then, one can direct her attention to “the sound as sound”, independently from its source and perceive it for itself. The third disposition is directed towards “the felt sound”, what does this sound does to me? After visiting these three dispositions we will focus on the third one, which is for me the doorway to poetic experience. As I perceive how the world affects/touches me, the distinction between subject and object, interior and exterior, me and the other tends to soften, and maybe sometimes vanishes. This intensive is not about gaining, nor capitalizing knowledge. It might be an opportunity, to dissolve layers of habits, ideas and certainties that separate us from the world. Angie is a performance maker and teacher. Her work is grounded by the questions of improvisation and collaboration. She is a principal collaborator with Bebe Miller Company (USA) contributing to the creation and performance of a 20-year body of work. Her dance-making also includes projects with long-time collaborator Chris Aiken and other recent projects including collaborations with Jennifer Nugent, Darrell Jones, Paul Matteson, and musicians Mike Vargas, Jesse Manno, and Carl Landa. 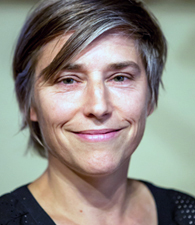 Hauser has danced with the companies of Elizabeth Streb, Liz Lerman, and Poppo Shiriashi, and she teaches dance-making, performance and improvisation throughout North America and in Europe and South America. 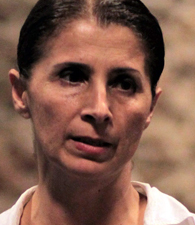 She is currently an Associate Professor and Chair of the Department of Dance at Smith College. Chris is a dancer, performer and teacher devoted to the investigation of dance improvisation, performance and somatic practice. 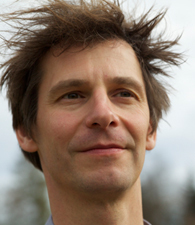 His approach is informed by his ongoing investigations of dance studies, aesthetics, perception and the practice of the Alexander Technique, ideokinesis, and myo-fascial bodywork. For the past fifteen years he has collaborated with Angie Hauser in the creation and touring of numerous evening-length performance works. He has also collaborated and performed extensively with Andrew Harwood, Kirstie Simson, Ray Chung and Peter Bingham. He is a Guggenheim Fellow and an Associate Professor at Smith College and the Five College Dance Department in Northampton Massachusetts. We care about the poetic, political, and movement possibilities contact improvisation offers. We teach skills in a way that support resilient dancing and expand the possibilities for moving with others. We create focused time for the study and development of the senses as a means for connecting more deeply with oneself and others, and for the development of the imagination as a ground for individual and group change and creative expression. We believe in the importance of becoming present to ourselves and others through the dancing. Our work is informed by our collaborations with many seminal figures in the field of contemporary dance including Nancy Stark Smith, Ray Chung, Kirstie Simson, Peter Bingham, KJ Holmes, Steve Paxton, Bebe Miller and Darrell Jones. Our classes will include skills that facilitate mobile support, becoming light/boyant, changing levels, accessing spherical space, modulating physical tone and resistance, falling, rolling and surfing, and navigating how you want to be touched. Dancers will learn ways of moving and perceiving that prepare them for the unknown and offer possibilities to explore the dynamics of leading and following. Through our attention to the pre-movement qualities we will learn ways to orient ourselves, both functionally and poetically, to submerse ourselves in the kinetic flow while allowing for the collaborative possibilities of creative gestures between partners. Günter is a dancer, circus artist, choreographer and teacher. After graduating from the movement-theatre-school Scuola Teatro Dimitri he worked in Circus Monti in Switzerland as a Clown. At the Kuopion Conservatory for Music and Dance in Finland he deepened his dance skills and performed afterwards in various companies (Compagnia Vitale/ Artistiktheater Mixtura Unica/ Trivial Dance Theatre). Since 1999 he has been touring with his solo artist comedy program as Heinz Herrmann. He has also been teaching Contemporary dance, Contemporary circus and Contact Improvisation at many universities and education programs (Savonia University - Academy of Music and Dance (FIN)/ Fontys Hogescholen – Academie for Circus and Performance Art (NL)/ Circomix (I)/ TIP – Schule für Tanz, Improvisation und Bewegung Freiburg). In 2006, Günter founded his own Company for Contemporary Circus HeadFeedHands, which continues to tour internationally and was awarded Kunstdünger Bühnenpreis, 1st jury- and audience prize at SoloDuo Festival Budapest and at NoBallet International Choreography Competition. Gestalt-Therapy methods influence his teaching work and have become more and more important while he choreographs for the stage. Günter has been practicing and teaching Contact Improvisation for the last 20 years and is especially interested in how CI enters into the performing arts. Olive and Otto collaborate as the BodyCartography Project. For over twenty years we create works and workshops that engage with the vital materiality of our bodies to create live performance, films, festivals and installations. Our recent works address questions of embodiment, kinesthetic empathy, transmission, and audiencing and exists in the encounter between audience and performer. We are interested in what new social relationships we can build if we pay close attention to how our bodies might feel their way around each other. The choreography of contact improvisation is important because it is proposed by surviving gravity, having someone’s center on top of our center and using your skeletal structure to help us accomplish this. In this moment of surviving we can easily get into an “averaging out”, or a simplifying of our position, rather than responding to the sensations of the touch and mass of our partner in the moment. If the dance is just going through CI positions, it is almost like it becomes normalized: we move to certain positions because we agree that that’s what the dance is. With this intensive we want to break open our CI practice. In “moving while touching” will use tools from Body-Mind Centering® and Material for the Spine to open up sensation in our bodies in the moment. Together we will play with heightening the feeling of improvisation in CI through our senses, bones, organs and blood. Steve Paxton developed „Material for the Spine“ in 1986 as an exploration of the movement possibilities within the muscles surrounding the spine, as well as the connections between the head, pelvis, and vertebrae. This solo practice is supported by specific exercises, body puzzles and ideokinetic imagery. This class will be all about shared weight, communication and a search for the understanding of our structure and mass. We will zoom into the idea of keeping a shared center, regulating and reorganizing our mass and weight while supporting and being supported. Focusing on a subtle and yet very clear and accurate communication and listening; initiating movement and direction and yet playfully letting go; organizing and reorganizing an aware body; connecting a listening point of contact to the whole of our body and our partner’s body, we will train an intelligent and aware body. 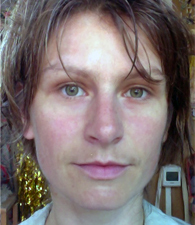 has taught Improvisation and Contact Improvisation in Art School during 12 years, in regular courses and workshops. 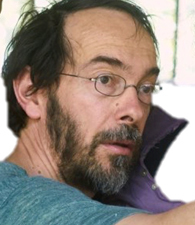 Improviser based in France, he leads and collaborates in creation and improvisation projects in France and abroad. 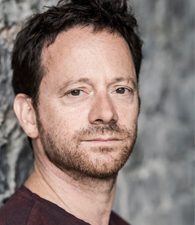 He has been involved in a theoretical and practice research (PhD Thesis) on the question of choreographic Exposure. 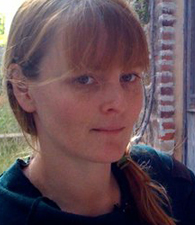 He produced a living resource of the Tuning Scores, a dance research and performance practice that Lisa Nelson (USA) has initiated and investigated. He is currently working on a book about Loïe Fuller seen through photography. His experiences are fed by the study of somatic techniques, BMC, Feldenkrais method, and by the different process of research and improvisation: Material for the Spine, Tuning Scores, Logo motion. In this class we will focus on two activities in the same way ; receiving & giving. From the attention of receiving & giving, we will explore the tone we use to dance and the possibilities to modulate it. This practice will support ways to find our moving body, as an enjoyed instability connected to the moving-ground under our feet and moving-sky constellation right in front of our eyes. The class facilitates awareness of touch as direction and receiving & giving as a tuning to the body. In dance, it’s a pleasure feeling and observing the variations in the expression of the tone. From this focus, how can we refresh our activity to be a (duet) partner? I am curious to invite you to explore the option to move out of the state of non-divided-ness, where contact is not a meeting with the other, but is rather a falling in one consciousness, mind, action, time, space, where the instant solution of emerging tasks turns to become available in every moment. In the frame of this class we‘ll explore falling as an effortless moving towards, as release of resistance, as a free lasting flight, as an embrace, consent and yield. What if we are able to come to the state of empty readiness, that will allow us to become mobile, penetrable, melting into any form, to be ready at any moment to fall in any direction? is a dancer, choreographer, dance and physical education teacher (ΜSc and PhD candidate finishing her doctoral dissertation related to CI). After her graduation, she took lessons at diverse studios: Movement Research, Merce Cunningham, Paul Taylor and Alvin Ailey in NYC and at Laban Centre, London. Since 2000, she has trained CI with Christina Klisiouni and she has participated in seminars with Nancy Stark Smith, Nitta Little, Daniel Lepkoff, Benno Voorham and others. She has been awarded as a young choreographer and she has received grants/funds from the Ministry of Culture in 2005, 2007, 2017-18 and 2018-19. She has been teaching CI for more than 10 years and lectures about somatic approach in dance in several professional dance schools and conferences. In this class we will focus on the support of the ground and how gravity opens paths for rising, for expanding in space and for moving softly and efficiently. These two opposing forces, support and expansion, provide ways to contact the others, to roll the point of contact and to function as one integrated system. These constantly moving roots are the anchors that enable us to „fly“ towards each other. A class inspired by Irene Downd‘ s articles on functional anatomy and its principles: the body’s function as an entity, its capacity to vary its shape without breaking, the helix-like and spiral movements created by joint motions, the infinite kinetic chains it can produce, etc. are dance artists and educators based in Philadelphia committed to the has performed and studied with originators of CI including Nancy Stark Smith, Nita Little, Karen Nelson, and has been enamored with the form for the last eighteen years. 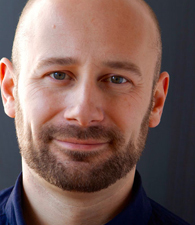 Additionally, Eric has performed with Keith V. Goodman and was a core company member of Oslund + Company. 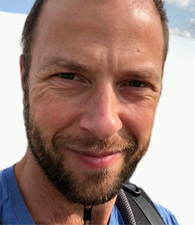 As a director and editor, Eric Nordstrom‘s dance films include: A Moving History: Portland Contemporary Dance Past and Present, and Standing on Gold, about living dance legend Simone Forti. Eric, with Portland State University, created the Portland Dance Archives. He studied with filmmaker Mitchell Rose and choreographer Bebe Miller at The Ohio State University, where he earned his MFA in Dance. Getting what you really want is vulnerable. Together, we will identify and give permission to follow your own interests within a contact improvisation dance. In exploring the line between selfishness and self-care, we will create a framework for you to embody what brings you to Contact Improvisation, creating dances that help to promote self-care through getting what you want out of every encounter, how to alert your partner to your needs, and how to meet in a place that offers fulfillment in every exploration. Forget feeling selfish and fully be you. Improviser, photographer, dance maker and stage/street performer; a teacher and ongoing student of movement art and therapy. As a certified Shiatsu and Watsu therapist, he is continuously curious about the exploration of the healing arts through movement and touch, while enjoying collaboration between different art forms. Inspiration is found in many surprising places, including everyday situations, Authentic Movement, the practice & play of CI, Music & Dance. He is a graduate of the movement department with an emphasis on choreography (B. dance) in the Academy of Music and Dance in Jerusalem. 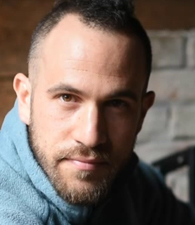 Tal teaches movement/dance and CI classes in various settings, schools and events through out Europe and Israel. This class offers an insight into an investigative approach to CI which emphasizes going beyond know patterns to re-fresh and replenish our dance. We will use the whole body, including hands, eyes, sit bones, asis pelvic bones, as well as verbal communication to get our bones and flesh moving from a fresh inspired perspective. On this layer of the physical engagement, we will infuse our stories/ imagination/inner life and emotions to allow the dance to reveal itself on a wide spectrum between the calmer controlled and meditative end; and all the way to the dramatic dynamic and surprising edges. A comfort level and skill of receiving/taking weight of another body as well as giving/sharing your own, is recommended for this class. Picking up on impermanence Laura choses improvisation and CI to trace and train focus that observes change. She initiates collective processes that facilitate and disseminate ideas around social connectivity and manifest via events that people can participate in and witness. The shedding of boundaries of self and other and the integration of performance and practice as part of everyday life are reoccurring themes. Recent work: The Shared Practice, the Free to Move Movement, and Trilogy Twerkasonata. 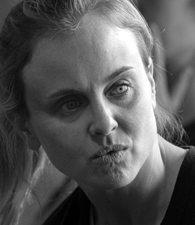 Laura Doehler, BA (Dance Theatre) and MA (Performance Making), teaches in HE at the National School of Circus Arts London and CI and contemporary dance as guest lecturer across Europe. We will throw magnets in the space and charge our playground with invisible but felt currents. It‘s the ‚all is one‘ idea with varying proximities and some clever tools to produce a togetherness that no longer is a matter of people dancing together but of playing with and exploring body extensions that earlier on in the day were separate. We will multiply our shoulder blades, grow a few more wings, melt centres that produce tails of many sizes and heads on top of windpipe spines that breathe into lungs held by 100 finger cages. It is a fun class, dynamic but also focussed, playing with how we perceive and letting it affect the way we move. was born in Ljubljana in ’78. He trained Judo and practiced singing from an early age, then began dancing with ballroom competitions. In 2007 he suffered a head injury that shifted his focus towards the potential of the present moment. In 2009, an in-depth observation of Steve Paxton’s Goldberg Variations video triggered what became an ongoing improvisation practice and provided a basis for a rich ongoing dialogue. Some of his performances are Goldberg Variations (2010), For Juliano Mer-Khamis (2013), Still (2014) and a collective work Monday at eight (2017). Collaborating with Steve Paxton, he has performed Paxton’s work Bound (1982), Flat (1964) and Quicksand (2016). His own research is deeply informed by CI and Lisa Nelson‘s Tuning Scores practice. We get lost in the dance, and we like it. Getting lost can be a break from planning, controlling, wanting. It can be a break from responsibility, of being oneself. We stop guiding, and become available… for what? Someone or something is sensing and responding there, where I become an available observer. It’s not exactly me, and yet I’m also not excluded. What are those processes in action? How can I, being the medium, still notice them from a perspective? If I am shown about them, can I perhaps redirect them? Sustain them? Take them as far as they will go? Naming them in a verbal exchange, can I share them with my partners? How can this dialogue remain a ‘proposition in the form of a question, to be answered daily’, like CI itself? 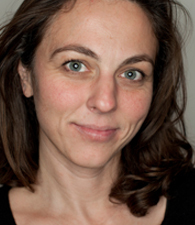 Based in Grenoble, she works as a dancer, choreographer and teacher. 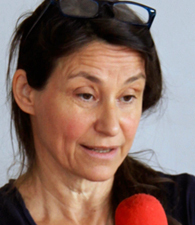 She creates „La Guetteuse“ company and developed her workshops and performances. She‘s also a dancer for other contemporary dance companies and travels sometimes in Asia to produce creations. By a sensorial and poetic approach, this class invites to question ourselves about our center when we dance. What‘s a center? And if we had two centers? Or several? Inside or outside of the body ? Having these questions as real playful support, we will explore how to navigate between power and lightness, rising the creativity in contact, and freeing ourselves from a politenesses that may be required sometimes. This class is an invitation to explore a new vocabulary of movement in solo, and find specific gestures to have a duet-dance always renewed and tasty. Through technical tools we will explore how the lift in CI could arise with fluidity and precision. Let‘s explore how extension can bring us into an exquisite understanding of kinetic chains in the body, increasing our range of motion and allowing us to dance our full frame. Through investigation of line, length, and directionality, we will fall upwards in the act of reaching through space and towards our partner. The eyes, the intercostal muscles, and the tips of our fingers will lead us to our edges, and we will envision our joints moving with additional interior space in order to maintain released extension. Working in solo, duet, and trio, we will explore how extension can help bring additional awareness to interior lines of energy and to the tactile experience of a point of contact. is a Brooklyn, NYC based dance improviser. He has practiced Contact Improvisation for 20 years, and frequently collaborates in process and performance with other artists. 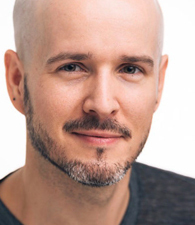 Bradley currently teaches as adjunct faculty at NYU/Tisch - Experimental Theatre Wing, NYU/Tisch - Dance & the Conservatory of Dance at Purchase College. 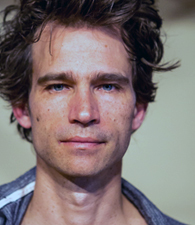 He also is faculty at Movement Research and Gibney Dance (NYC) and offers workshops in Contact Improvisation. Recent collaborations include working with the visual artist Nick Cave / The Let Go (Park Ave Armory) and he will lead public classes in Contact Improvisation at MoMA (Museum of Modern Art, NYC) in January 2019. Contact Improvisation offers the dancer an ecosystem, a complex thicket full of momentum, inertia, friction and gravity. Exploring this landscape with our tactile intelligence can be deeply satisfying and even sublime - but it can also leave us feeling lost and untethered. In this class we will utilize states of stillness and motion to nourish our dancing, establishing deep supportive connections with ourselves and the dancing environment, and to find a greater sense of clarity, ease, and joy. is a Dancer, a teacher and a therapist. For the last 25 years she studied dance within different structures. She was a dancer at „Vertigo“ Dance Company (IL). Today she is a dancer at independent dance projects. The last 10 years she has been teaching CI and Contemporary Dance in Israel and abroad. 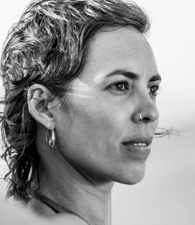 Since 2 years she is a Curriculum Director at „Ha‘kvutza“ Dance School in Tel Aviv, where she also teaches CI and Contemporary Dance. She has been teaching internationally at various CI festivals. She is part of the production team of the „Israeli CI Festival”. 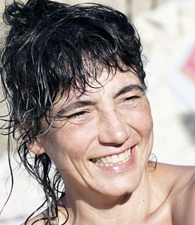 In Tel Aviv, she has a private Clinique of Reflexology, Bach Flowers, Naturopathy, and Nutrition. CI for her is a way of life. She loves learning, teaching and feeling the endless movement inside and around her. Going mindfully into our somatic experience allows us to enliven and incorporate more qualities into our dance, thereby adding more richness and diversity out of a place of ease. In this class we will start with personal floor work as a time for deep listening to ourselves. This will be a time of exploring different qualities, noticing our somatic experience, while letting our awareness deepen our movement. As we progress we will take our newly found embodied wisdom into a unique floor sequence and from there in to CI. I see great value in understanding, embodying, and feeling grounded and secure on our own first, and then meeting our surroundings, and letting it all mix, change, and dive into the unknown. Fine-arts school student and percussionist in a rock band, he started learning dance - and performing - in the middle of the 90’s, in different companies in France, Belgium and Switzerland. Besides contemporary dance and martial arts techniques, he studied CI with P. Kuypers, F. Beaubois, K. Simpson, A. Harwood, C. Aiken, N. Stark Smith, K. Nelson, R. Chung, KJ Holmes. Creating his own company (cie épiderme) in 2002, he choreographs a physical dance very connected to music performed live. Much influenced by release technique, floor work, contact-improvisation, acrobatics, martial arts (…) he mixes all these influences in a fun and challenging, playful and physical personal training. In Contact Improvisation, we need to trust and to feel safe with our partner(s). Meanwhile we can also decide to surprise (and accept to be surprised by) him/her/them, with awareness and care, by playing with the unexpected. This can bring a playful adrenaline and a pleasant negotiation with fears, reflexes and habits… as a way to question, identify and challenge them. This is also a playful way to look back to the martial roots of Contact Improvisation. I met contact improvisation in 2005, recognizing something somehow very familiar in it. Since that moment I’ve studied with many international teachers and began to give classes. I like teaching CI because I find a great value in it as practice of movement that it is also an invitation to observe myself in relation with me, the space and the others. I have a strong interest in the art of improvisation as the capability to develop a clever open attitude to understand and analize the context and to develop strategies to respond to the the environment, in a real time. In 2018 I’ve founded CorPoetica, a non profit organization that investigates movement and multi disciplinary improvisation as a tool to develop self awareness and an healty and poetic attitude towards life. Fascia is a connective tissue beneath the skin that attaches, stabilizes, encloses, supports, and connects : muscles, organs, ligaments, tendons, bones and the body as a whole. It wraps, holds, shapes every bodypart, creating a network of interconnected tissues that allows our body to be a tensegrity structure, capable to absorb pressure and to come back to the original shape. It is a continuum. What if I think of my body as a collection of elements that float in a jelly fluid? How does this image changes my perception of weight, directions, effort? In this class we will sensibilize our touch and proprioception to get in contact with the connective tissue. We will ask how to bring the quality of fluidity, wholeness and interconnection in our movement in solo and with a partner, reaching for the sensation of being softly wrapped up by this stable and elastic container that hold us up.